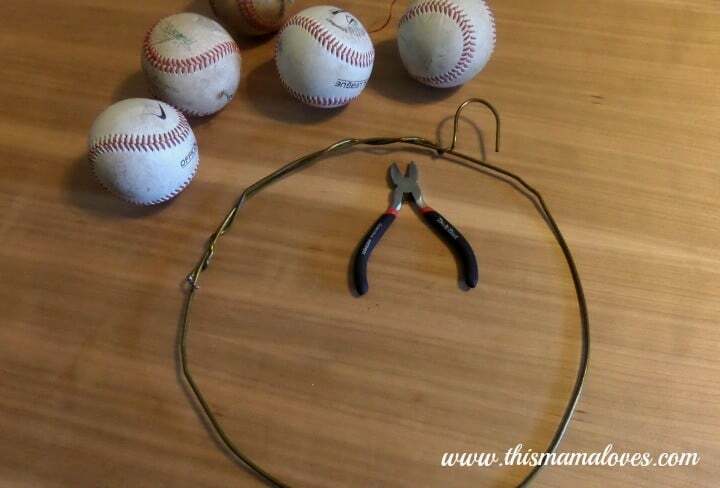 Our family loves everything baseball, especially Boston Red Sox Baseball and Baseball Decor like this DIY Baseball Wreath. 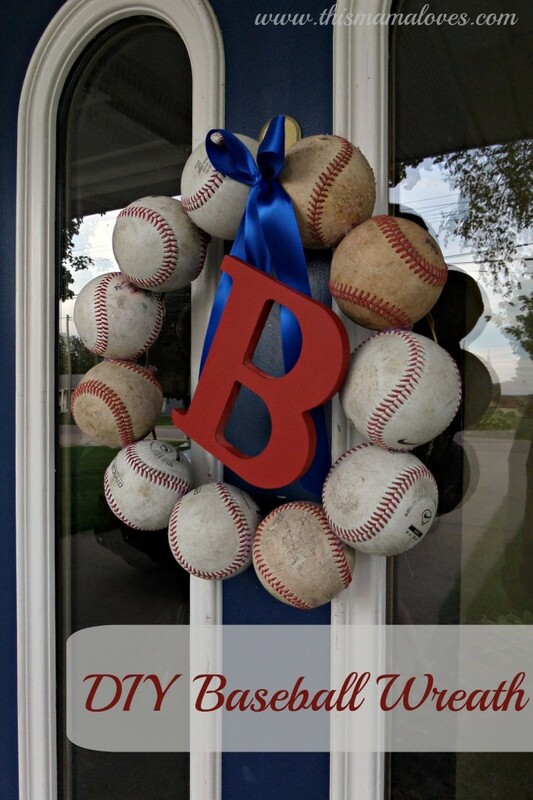 We have tons of baseballs around our house but none that my son was willing to part with and I really wanted the baseballs to look aged and well used so I headed to the thrift stores and found enough to create this great wreath just in time to show my love of baseball for the end of this season. I like to make things from stuff around the house as much as I can and keep costs down so instead of purchasing a wire wreath form, I used an old wire coat hanger. I took bent it into a circle but left the hook part of the hanger in place. I knew that the wreath would be heavy so I thought this would be the best way to hang the wreath when it was finished. To attach the balls to the wreath, I inserted small screws into each one. I didn’t have to drill wholes as the screws went into the balls very easily. I used pliers to hold and twist the screws rather than a screw driver because I didn’t want to chance the screw slipping. Once the screws were in each ball, I cut a length of copper wire and twisted it around each screw. This copper wire then gets twisted around the wire wreath form or coat hanger to hold the ball in place. Add wire to each ball and attach them to the wreath. 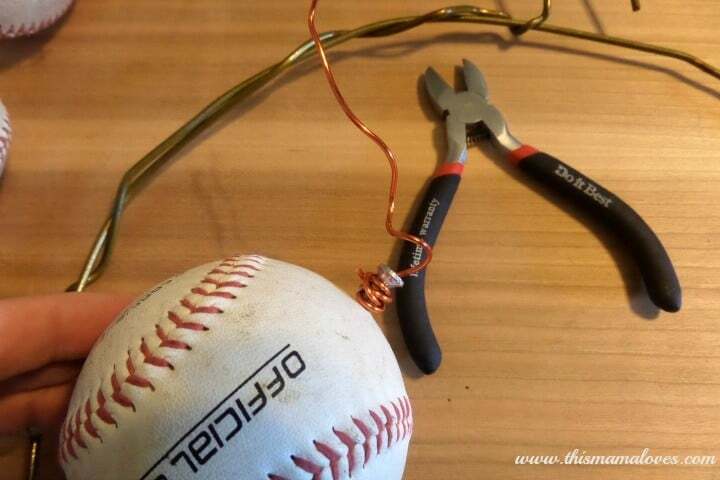 Use a small amount of hot glue between each ball to keep them from shifting or slipping. I also used a bit of hot glue to cover the wire and screw on the back of the ball. This will keep it from scratching the door or wall where you hang the wreath. I purchased a small wooden B and painted it red for Boston Red Sox and blue ribbon to keep with the team colors. I tied a simple bow in the ribbon and attached it to the back of the B with hot glue and attached the bow to the wreath. It’s a great wreath for the front door of the house or would be perfect for a boy’s bedroom! Oh that wreath is so neat! We are huge baseball fans in our home! I have to make one to hang on our front door! 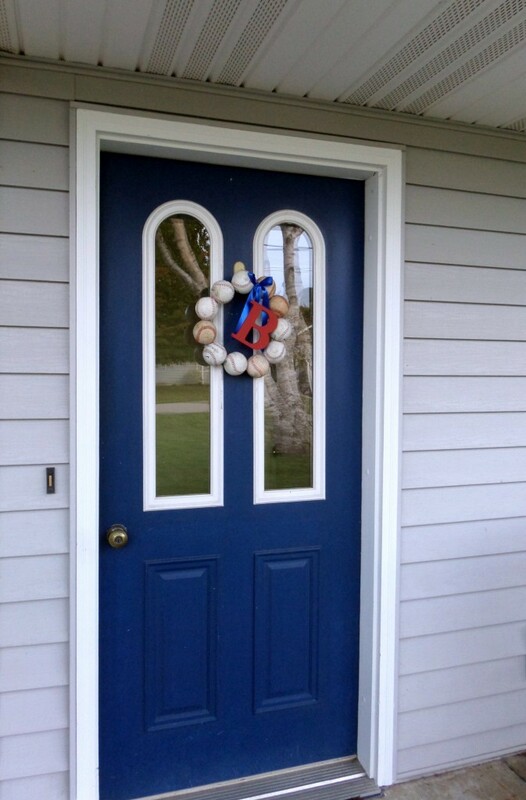 That turned out really wonderful and it looks really great on your door! This is just the coolest wreath, I’ve seen in a while. Definitely pinworthy!